Carbon fiber-reinforced plastics, also known as CFRP, are becoming a subject of intense research as aircraft components. However, this trend is raising the demand for sustainable recycling concepts. Fraunhofer will describe an advanced technology at the ILA expo, which will be held from April 25 to 29, 2018 in Berlin (Hall 2, Booth 304). This technology can change recycled carbon fibers into materials for both fuel cells and batteries, thereby saving costs, enhancing the CO2 balance, and paving the way for new ways of recycling in aircraft production. Today’s modern wide-body airplanes include more than 50% CFRP. For instance, the material is installed over a huge area in the fuselage or wings. Since a plastic matrix is embedded with carbon fibers, the composite is lighter than the materials used before and at the same time it is also extremely stable. Since airplanes have lower weight, they require less amounts of fuel. This represents a major advantage for the aviation industry. "The manufacturing and processing of the CFRP is currently very time-consuming. The demand for sustainable recycling concepts is therefore steadily increasing," observes Elisa Seiler, a scientist at the Fraunhofer Institute for Chemical Technology ICT in Pfinztal, Germany. Moreover, the amounts of CFRP recycling material are incredible: for instance, in the case of Airbus 350, the CFRP material adds up to more than 65 tons. "In addition to this there are other relevant scrap quantities that already arise during production," adds Seiler. When it comes to fiber-reinforced plastics, the Fraunhofer ICT has years of expertise in the development of technologies. At the ILA event—the aviation and aerospace innovation trade fair—the researchers will present a novel idea that will be applied to recover materials for fuel cells and batteries from recycled carbon fibers. Along with partners, the team was able to use the recovered carbon fibers and ultimately developed a model of a bipolar plate – a type of electrode – on a large scale. The results of the study are based on research from the "RETRO" and "Graphit 2.0" projects. Electric drives are now also a serious topic in the aviation industry. Manufacturers can directly perform value-preserving recycling by transferring materials from one application to the next. Being electrically conductive, the carbon fibers can be used as a replacement for natural graphite, which also contains carbon. For the German economy, carbon is a resource-critical raw material which had to be presently imported from China at an exorbitant cost. Another benefit of recycled CFRP is that it can be employed for additive manufacturing processes, for example, 3D printing. "This is also a trending topic in the industry that makes production processes more efficient and saves costs," says Seiler. In any case, aircraft manufacturers also need to conform to the European Union (EU) requirements that have been in place since 2015. As per the EU requirements, up to 85% of the typical weight of a used vehicle must be recycled. Additionally, the landfilling of CFRP is banned In Germany, and waste incineration plants can decline to accept the material. A unique process has been developed by the CFRP experts that can be used to recover carbon fibers from the plastic matrix. To achieve this, they burned the plastic matrix surrounding the carbon fibers using microwave radiation. To ensure that the fibers do not burn up at high temperatures (up to 900 °C), the combustion has to be carried out without oxygen. "In technical jargon, this is called pyrolytic decomposition," Seiler explains. An added benefit of microwave radiation is it provides energy efficiency, which means it is not necessary to heat an entire oven but just the component alone. At the Fraunhofer ICT, the coworkers of the Polymer Engineering department embedded the recovered fibers in a thermoplastic material. 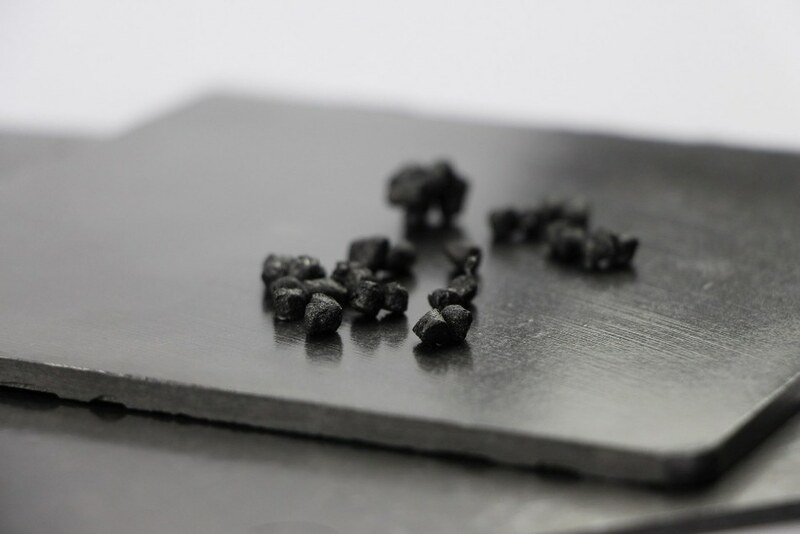 This composite material possesses properties that are similar to graphite and can be used for producing bipolar plates. "Our prototype passed all the tests for conductivity, density and corrosion resistance perfectly," reports Seiler. We’ve proven that it’s generally feasible to use recycled CFRP fibers to produce bipolar plates for batteries and fuel cells. This shows that recycling works in a holistic approach. This is particularly interesting for the aviation industry. Both the bipolar plates and the recycled CFRP made from the recycled CFRP fibers can be seen at the ILA event. The subsequent steps until early summer will involve the characterization of the bipolar plates within the network of battery cells and research regarding the life cycle assessment. "Then, we want to tune the technology so that we can manufacture bipolar plates from recycled CFRP in series – for example, with an aviation partner," concludes Seiler.